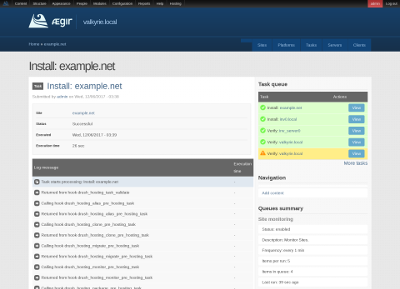 Ægir makes it easy to install, upgrade, and backup an entire network of Drupal sites. 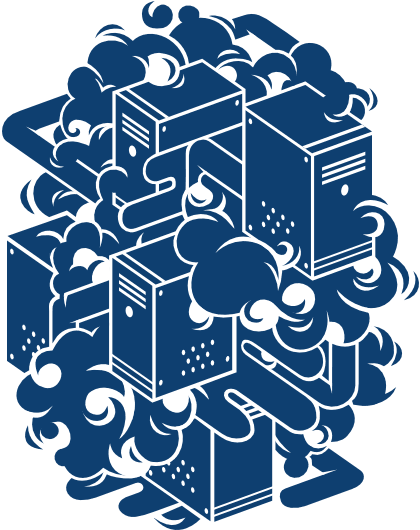 From deployment, installation and configuration through final archiving, full rollback capabilitites ensure reliability for rich, stateful applications. Use Git to ship configuration across development, staging and production environments, or deploy custom code across entire platforms. 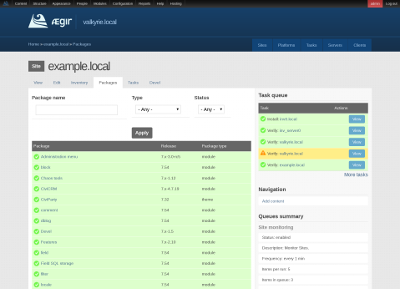 Ægir is built on Drupal and Drush, and supports many add-ons through contributed extensions. 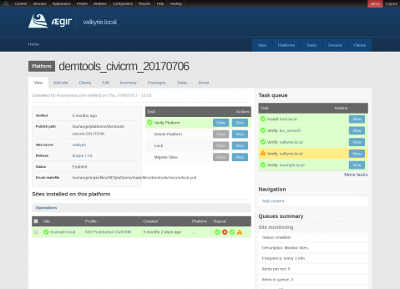 Ægir allows you to deploy and manage many sites, and can scale across multiple server clusters. Aegir is built by a community of system administrators and developers who share Drupal deployment tools, strategies and best practices, instead of continuing to write our own little shell scripts. 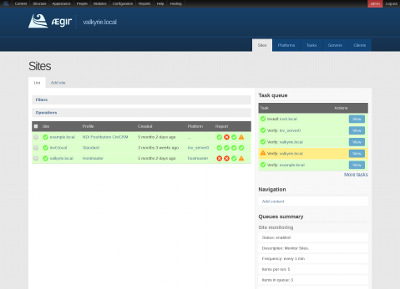 Check out Ægir’s user interface. See the Installation Guide for more details, or guidance on installing on other operating systems. 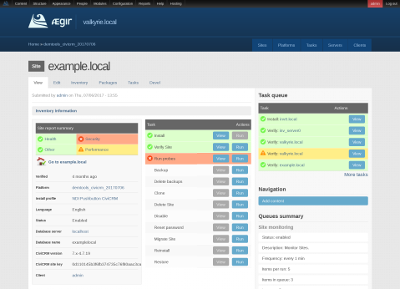 Aegir is under active development. You can check out the latest code from Drupal.org’s Provision, Hostmaster and Hosting projects. Donations, big or small, are always appreciated! If you’re looking for paid support or consulting, because Ægir is a critical component of your infrastructure, contact the Ægir Coop or any of the other supporting organizations. These companies can also help with custom development, if you’re interested in extending Ægir with new functionality. Extending Ægir with new features. You can help to make these happen! Our passion to produce a great product, drives us to keep working on Ægir. We maintain and develop it mostly because we use it ourselves. However, we do a lot of work to help the community, such as supporting older versions and making upgrade paths user-friendly. Core team members don’t generally need these, so donations validate more time being spent on them. Here we see a list of all sites hosted on this Ægir system. Here we see a platform, including relevant tasks and sites. 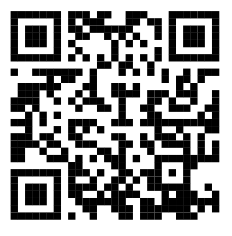 Here we see a detailed site page, including relevant tasks. This image illustrates the use of contributed modules (i.e., reporting on the site’s health) as well as a custom module (i.e., the “inventory” tab). Here we see the output of a task. Here we see a list of all packages (modules, themes, etc.) available on this site. Here we see a comparison of the packages on the source and target platforms, im preparation for a migration.